The Auto-Nav block gives you a tree based navigation for your website. 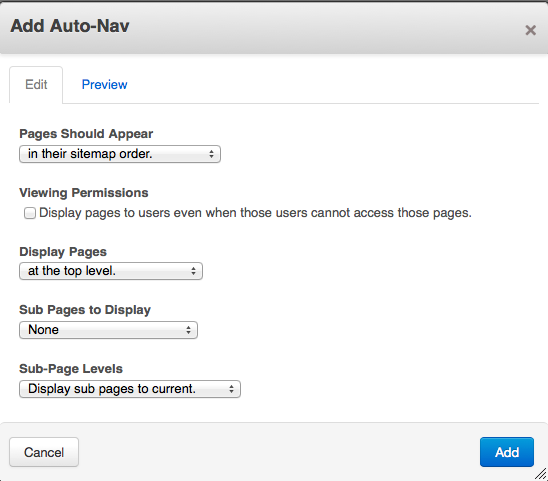 The auto-nav block will return a list of pages in tree form matching the settings you use. You can then use a custom template to control formatting of the menu. Pages should appear: In this drop-down menu you select how you want the pages to be ordered in the nav. They can be arranged how they are in the sitemap, chronologically/reverse chronologically, or alphabetically/reverse alphabetically. Viewing Permissions: You can choose to display pages that users may not actually have access to. If a visitor clicks on a link to a page they do not have access to, they will be prompted to login with an account that has access before they can continue. Display Pages: Here's where you choose what level of the tree you want to start displaying pages. Sub-Pages: Choose the amount of sub-pages you want displayed, if any. - No sub-pages: This will display only the top level of the nav you've selected. - Relevant sub-pages: Only displays the sub-pages relevant the page you're currently viewing. - Display breadcrumb trail: Shows only the trail of pages that led you to the current page. - Display all sub-pages: Shows all sub-pages. Sub-Page Levels: Here's where you choose exactly how many sub-pages are shown. - Display sub-pages to current: Shows all sub-pages that led you to the page you're currently viewing. - Display sub-pages to current+1: Shows all sub-pages that led you to the page you're currently viewing, plus another level below the page you're viewing. - Display all: Shows every sub-page attached to every page under the level of nav you've chosen. - Display custom amount: You choose how many levels of sub-pages you want your nav to display. You can click into the Preview tab to get a sense of what your Auto Nav will display with your current settings.